Do you want to make, repair or restyle your clothing, accessories, and home decor? I’ve been teaching sewing professionally since 2010, and I would love to share my knowledge with you! Private sewing lessons are definitely for you if you’ve been wanting to learn how to sew (or learn how to sew better), but you never seem to be able to make it to a sewing studio or fabric store for group classes. Perhaps you are just more comfortable in one-on-one teaching situations, or maybe you keep unusual hours. If you live in the Washington, DC area, I am very happy to come to you for private sewing lessons, and design a curriculum specific to your interests and skill level. Don’t have a sewing machine? I can bring one for you to use during our lesson, no worries. The only thing I love as much as sewing is helping other people love it, too. Whether you are a brand new beginner, are stuck in the middle of a project, or have a very specific sewing goal, I’m confident I can help you! My hourly rate is $75, payable by cash or check at the end of each lesson (minimum 1 hour). You may want to purchase a package of lessons in advance, at a discounted rate (see below for package options). If you are a brand-new beginner, then I have a set introductory curriculum for you that requires a 2 hour lesson. That includes an introduction to the sewing machine, learning all its parts and how they work together, basic machine operation and troubleshooting, plus making a small project, so you can see your new skills in action! Beyond that, the length and content of your subsequent lessons will be completely customized! I will design each lesson to fit your needs and interests specifically. After you purchase your lessons, I will contact you to set up a schedule for us. Whether you prefer daytime or evening, weeknights or weekends, we will make it happen! I take my sewing evangelism very seriously, and so my schedule for private lessons is very flexible. I want you to learn to sew and to love it! I am happy to bring the absolute awesomeness of sewing right to your door. But right now I can only do that for those of you living in the Washington DC metro area. Are you somewhat Metro accessible? Then we are definitely in business. Not sure? Contact me before you purchase a package, and we’ll work something out. If you are on my Syndicate mailing list, you’ll be the first to know when my private lessons go on the road! You can cancel or reschedule your private sewing lessons for a full refund or credit if you contact me at least 72 hours in advance of your scheduled session. For cancellations within a 72-hour window, I can’t offer a refund, but will be happy to reschedule your session for a better time. You and I will be chatting before each of your lessons to talk about your project and the exact materials you’ll need. 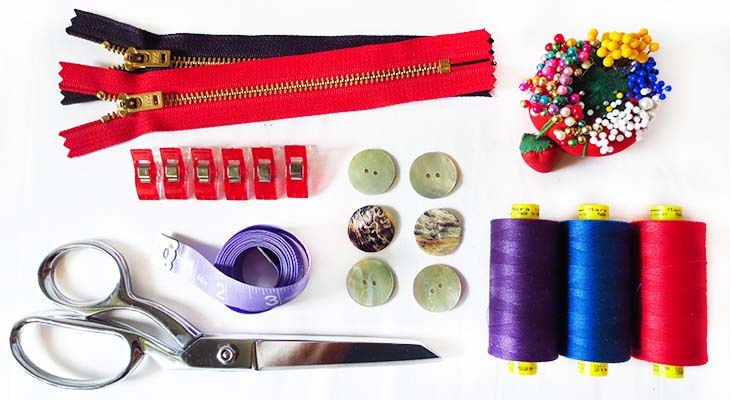 I am happy to bring basic sewing supplies for you to use during your sessions, or I can recommend tools for you to buy to start your own well-stocked sewing kit. If you have your own sewing machine, great! We’ll use that. If not, no worries, I will bring one for you to use during any private sewing lesson you schedule with me. Any questions? Please don’t hesitate to contact me. I can talk about sewing all day long, so don’t be shy! My plan is to sell a sewing product in the next 3 months. Ms. Valerie taught me how to use a sewing machine/serger, cut fabric, and make my own pattern. She taught me everything and provided me so many pointers as being crafter. With my (3) 2 hour sessions, I never wanted her to leave. She has a great energy and an awesome teacher. I am so grateful to have met her. Thanks Ms. Valerie for your knowledge! You are the best!! I've been hoping to learn to sew for a while, and I'm so glad I finally found Valerie! She is very accommodating, knowledgable, and patient! I am learning so much and am really enjoying exploring my creative side. I highly recommend learning to sew with Valerie! I have been learning to sew from Valerie for several years now and she has always provided clear and reassuring instruction, and really knows how to tailor her teaching style to be as hands-on (or not) as a particular student may need. If you have a sewing problem, Val will solve it! Valerie is the Mary Poppins of sewing - she has all the answers. Supercalifragilisticxpealidocious!